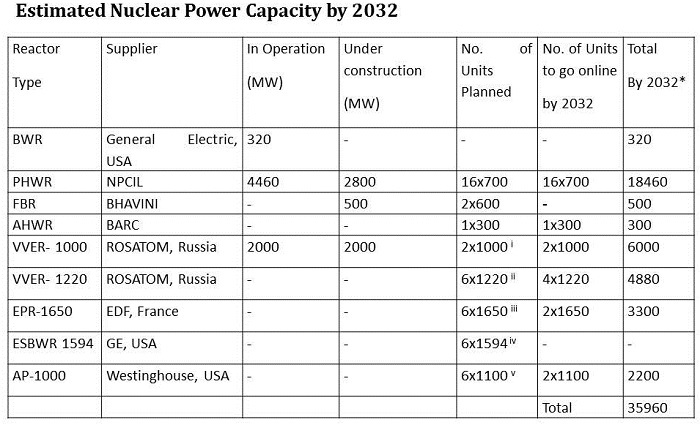 Vivekananda International Foundation: Achieving 63 GW Nuclear Capacity by 2032: Can it be done? Achieving 63 GW Nuclear Capacity by 2032: Can it be done? The announcement of the India-US nuclear cooperation initiative in 2005 and the subsequent grant of an India-specific waiver by the Nuclear Suppliers Group (NSG) in 2008, however, opened up new possibilities before country’s policy planners to rapidly bridge the projected deficit in country’s future energy demand and supply. The DAE had projected this deficit to be of the order of 412 GWe in the year 2050 and estimated that the import of at least 40 GWe of LWRs in the next two decades would significantly bridge this deficit.3 As a result, the DAE had modified the 2004 study by planning for significant capacity addition through imported LWRs instead of relying solely on the indigenously designed reactor technologies. Besides supplying large amounts of uninterrupted power, the projected nuclear capacity is also expected to help the country in meeting its climate commitments to a certain degree. In 2015, India’s intended nationally determined contribution (INDC) as part of the Paris Agreement reckoned nuclear power as a safe, environmentally benign, and economically viable source to meet the increasing electricity needs of the country. The INDC, in principle, seeks to: (a) reduce emission intensity of India’s GDP by 33 to 35 percent by 2030 from 2005 level; and, (b) to achieve about 40 percent cumulative electric power installed capacity from non-fossil fuel based energy sources by 2030.4 In this context, the INDC has once again reiterated India’s efforts in achieving 63 GWe of installed capacity by the year 2032. Notwithstanding such policy pronouncements, since 2008 the expectations around rapid growth of India’s nuclear power programme have realized rather slowly. After the initial euphoria surrounding the nuclear deal, the Indian Nuclear Power Corporation (NPCIL) has moved at snail’s pace to initiate construction work at new Nuclear Power Plant (NPP) sites identified in the 12th plan period. 5 This is mainly due to the emergence of complex challenges such as the deadlock over ‘right of recourse’ provisions incorporated in country’s Civil Liability for Nuclear Damage Act (CLND Act) enacted in 2010 by the Indian Parliament.6 The recourse liability provisions stipulated in the CLND Act had put the nuclear industry on back-foot and raised serious doubts about the planned expansion of India’s nuclear power programme. The CLND act is also believed to be the primary reason behind the prolonged contractual negotiations with foreign vendors except for Russia thereby delaying the progress on deployment of imported LWRs in the country. Likewise, the Fukushima nuclear crisis in March 2011, which heightened public concerns over nuclear safety proved to be a major hurdle for the DAE. Owing to adverse public reaction at places like Kudankulam, and other NPP sites, the NPCIL had faced serious difficulties in expediting construction and commissioning related activities. Consequently, the capacity addition planned through both indigenous as well as import routes has taken place at a much slower pace than required by ambitious generation targets the country had set for itself. In recent years, however, the DAE/NPCIL has managed to overcome many of the aforementioned challenges which led to significant delays and under-performance. For instance, the resolution of the civil nuclear liability impasse through measures such as operationalising the Indian Nuclear Insurance Pool (INIP) in June 2015, the ratification of the Conventional on Supplementary Compensation (CSC) in February 2016, and the clarification of rules pertaining to ‘suppliers liability’ has provided greater predictability about risks in country’s nuclear sector.7 The Indian industry, in particular, is fully assuaged about the concerns over recourse liability arising from the CLND Act and is willing work in mission mode for building a large fleet of indigenously designed pressurized heavy water reactors (PHWRs). In view of these developments, can the DAE/NPCIL, therefore, move forward rapidly and achieve the stipulated target of 63 GWe capacity addition by 2032? Achieving this goal would require building a large fleet of NPPs in the next decade. For instance, the total capacity at present including plants under operation and construction amounts to about 10 GWe, and that the DAE would need to add another 53 GWe in next 13 years, which means adding roughly 4 GWe capacity per year. While this presents a massive scaling-up opportunity for India’s nuclear sector, attaining this goal by end of next decade is certainly an uphill task. As per the DAE’s current plans, a large capacity addition of about 33-34 GWe is planned through the import route. In the deployment of imported reactors. However, the DAE is likely to face several challenges and uncertainties and it appears unlikely that all of it can be achieved by 2032. Among the various foreign vendors, only the Russian collaboration has so far taken-off and can be expected to deliver by 2032. The Atomstroyexport has successfully built two 1000 MWe Water-Water Energetic Reactor (VVER) units at the Kudankulam site and is confident about completing next four units in quick succession. In addition to Kudankulam NPP project, plans are also underway to build six more VVERs of 1220 MWe capacity at a new site which is yet to be finalized. If the project is approved by end of this decade, it can be expected at least four such units can come online by 2032. In case of French EPR and the Westinghouse AP-1000 units, the progress is going to be much slower in view of the extended construction schedules seen in countries like China and Finland. Also, contracts for building these reactors are yet to be concluded and it is not clear whether these units will be built in fleet mode. By 2032, therefore, out of 12 planned units, only four such units can be realistically expected to come online. The DAE can, therefore, reach closer to this goal by moving expeditiously along the indigenous technology pathway. Early this year, the government has accorded ‘in principle’ approval for building as many as 10 indigenously designed PHWRs of 700 MWe capacity. 10 Together with earlier approvals, the decks are now clear for building as many 16 PHWRs units of 700 MWe each in the country. These reactors will be built at places like Gorakhpur in Haryana, Chutka, and Bhimpur in Madhya Pradesh, Mahi-Banswara in Rajasthan, and Kaiga in Karnataka and will make a significant capacity addition of about 11.2 GWe. India has a well-established nuclear manufacturing industry to supply a variety of components and systems for building a large number of PHWRs in the country. Also, the NPCIL has accumulated significant experience in building these reactors at places Rawatbhata and Kakrapar sites. v - AP-1000: Westinghouse is expected to make a commercial proposal after exiting bankruptcy proceedings by early 2018. Building so many units in fleet mode, however, presents an unprecedented challenge for the NPCIL. The timely realisation of these projects will, therefore, contingent upon how expeditiously the NPCIL is able to complete land acquisition and pre-project activities at various sites, obtain timely clearances from regulators and coordinate long-term construction, procurement, and commissioning activities. The NPCIL is reported to have completed the land acquisition for Gorakhpur, Chutka, and Kaiga sites, and is in advance stages for the Mahi-Banswara site. 11 For the remaining regulatory approvals, the NPCIL will have to undertake aggressive efforts and prepare these sites for the early launching of construction activities. This applies equally to the indigenous Fast Breeder Reactor (FBR) programme, though the standardization of the FBR design is likely to take some more time. The planned capacity addition for 2032 is nonetheless likely to see a shortfall owing to delays in building imported LWRs from France and US. These delays can be partly reduced by seeking early conclusion of the long-drawn contractual negotiations with French and American companies, which, in turn, could dynamically change the capacity estimates and help to reduce the shortfall. As reflected in India’s INDC’s, the country is making conscious efforts to move towards more environment-friendly forms of energy and nuclear energy is regarded as an indispensable element of this transition. Addressing various challenges in the way of large-scale deployment of nuclear power will, therefore, go in long-way for the country to enable this transition and secure it's current and future energy needs. 1 See, “Strategy for growth of Electricity in India”, Department of Atomic Energy, Government of India; Grover, R. B. & Chandra, S. (2006), “Scenario for growth of electricity in India”, Energy Policy 34 (2006) 2834–2847, ULR: https://www.sciencedirect.com/science/article/pii/S030142150500131X. 2 Planning Commission (2006), “Integrated Energy Policy: Report of the Expert Committee”, Government of India, August 2006, URL: http://planningcommission.gov.in/reports/genrep/rep_intengy.pdf, pp. 22. 3 Kakodkar, A. (2008), “Evolving Indian Nuclear Programme: Rationale and Perspective”, Public Lecture at the Indian Academy of Sciences, Bangalore, July 04, 2008. 5 Department Of Atomic Energy (2012), “ Nuclear Power Plants In The Twelfth Plan”, Unstarred Question No.2949 To Be Answered On 20.12.2012,Government of India, URL: http://www.dae.nic.in/writereaddata/rsus2949.pdf. 6 Ministry Of Law And Justice (2010), "The Civil Liability For Nuclear Damage Act, 2010”, URL: http://lawmin.nic.in/ld/regionallanguages/THE%20CIVIL%20LIABILITY%20OF%20NUCLEAR%20DAMAGE%20ACT,2010.%20(38%20OF2010).pdf. 7 Ministry of External Affairs (2015), Frequently Asked Questions and Answers on Civil Liability for Nuclear Damage Act 2010 and related issues, February 08, 2015, URL: http://www.mea.gov.in/press-releases.htm?dtl/24766/Frequently_Asked_Ques... Press Information Bureau (2016), Launching of Nuclear Insurance Pool, Department of Atomic Energy, 03-March-2016; Ministry of External Affairs (2015), India submits the Instrument of Ratification of the Convention on Supplementary Compensation for Nuclear Damage (CSC), 1997, February 04, 2016, URL: http://www.mea.gov.in/press-releases.htm?dtl/2632/India+submits+the+Instrument+of+Ratification+of+the+Convention+on+Supplementary+Compensation+for+Nuclear+Damage+CSC+1997 . 10 Cabinet clears proposal to build 10 atomic reactors, The Hindu, May 17, 2017, URL: http://www.thehindu.com/news/national/cabinet-clears-proposal-to-build-1... .
11 Information received from Shri Lokesh Kumar, NPCIL, Mumbai.